Growing, connecting and inspiring the Midwest tech talent community for more than 25 years. In the 1980s, the economy in Nebraska and much of the Midwest was in crisis. Thousands of families lost their farms due to low farm prices and overwhelming debt. Storefronts in communities across the region were empty. Banks failed, and Omaha was hard-hit when Enron moved corporate headquarters to Houston in 1986, and took 3,000 jobs with it. Business, education and government leaders were increasingly concerned about the future of Nebraska’s economy. Several studies were commissioned to begin a charting a course going forward. A key finding from this research was that Nebraska — Omaha in particular — was well-positioned to take advantage of a robust telecommunications and information technology infrastructure. At the same time, there was a critical shortage in the availability of skilled tech workers to support growing reliance on technology. In order for the state and the community to realize the potential economic benefits of information technology, an organization needed to step forward to lead the charge in building the tech talent pipeline. Leaders from business, state and local government, chambers of commerce and educational institutions gathered to consider how to approach the issue. The conclusion was that a new organization — a neutral, non-partisan, not-for-profit organization — should be formed. The concept was an organization that could work at the nexus of business, government and education to coordinate and facilitate efforts to address the shortage of IT talent. In 1992, the Applied Information Management Institute was born. Through a grant obtained in 1995, AIM began an experiment to leverage an emerging technology called the World Wide Web. The goal was to match college students with IT internship opportunities at Omaha area businesses. An innovative, custom-developed web application designed by AIM staff allowed employers to post their internship opportunities online. Interested students could review postings and submit applications through the system. It was so succesful that participating employers requested the ability to post regular job openings on the site. That marked the beginning of one of AIM’s most successful initiatives to date: AIM Careerlink. 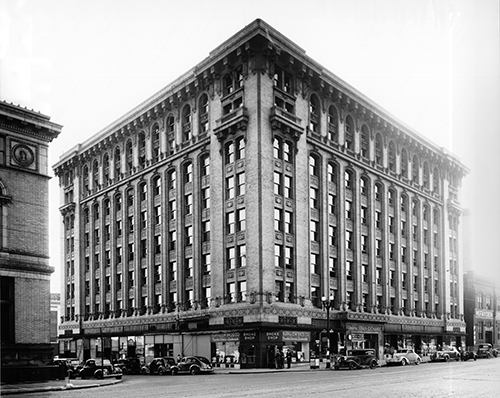 In 2005, AIM purchased Omaha’s historic Grain Exchange building. Built in 1915, the building housed the Omaha Grain Exchange, a cash market where sellers presented grain for sale. Buyers were companies that specialized in export markets, plus various grain processing plants that produced flour, cereal, feed, and other grain-based products. 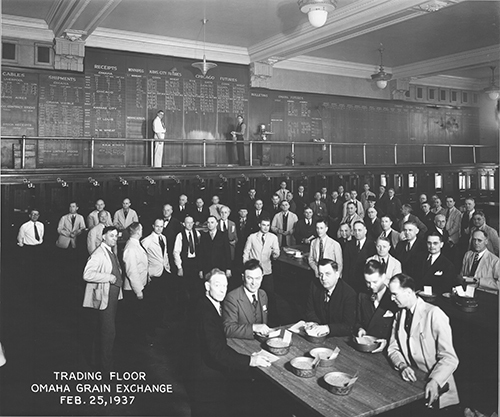 The trading floor was located on the 7th floor of the building. 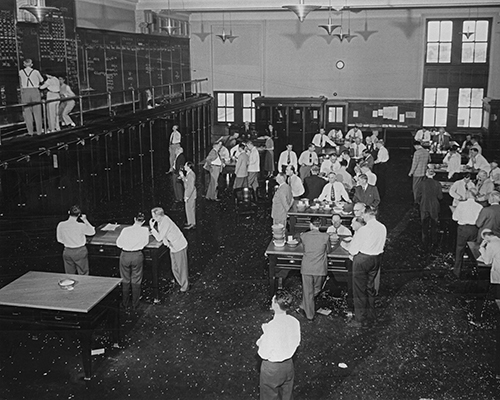 The south wall of the 7th floor had a large chalkboard where prices were recorded by hand. You can see a replica of that board there today. 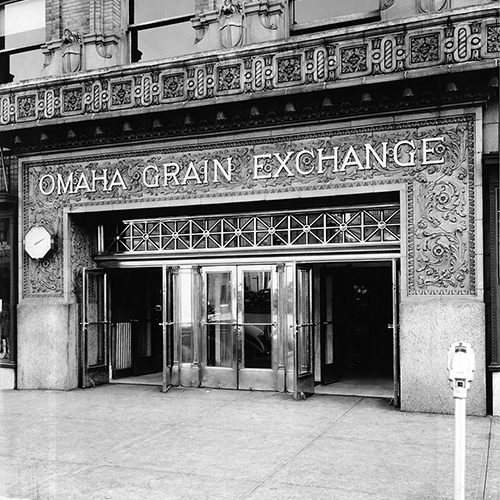 The Grain Exchange was essential to the economic health of Omaha and the wider region. A century ago, the Omaha Grain Exchange Building was constructed to serve the needs of the primary engine of economic growth of the region – agriculture. Today, the Exchange Building continues that vital role of supporting a primary engine of economic growth of the region – information technology. The proud heritage of the building’s past is honored as it now serves as the home for an organization focused on the future technology of Omaha, Nebraska, and the entire region – The AIM Institute. AIM continues to build on its proud legacy. Our mission has crystalized as an innovative not-for-profit community organization dedicated to many of the same challenges presented 25 years ago. AIM is a catalyst for the tech community, for development of the workforce, for educations, for tech startups, and for the good of Omaha and the surrounding areas. A COMMUNITY WE NEED FOR A FUTURE WE WANT. Keep up with our latest news, events and opportunities on our social channels.